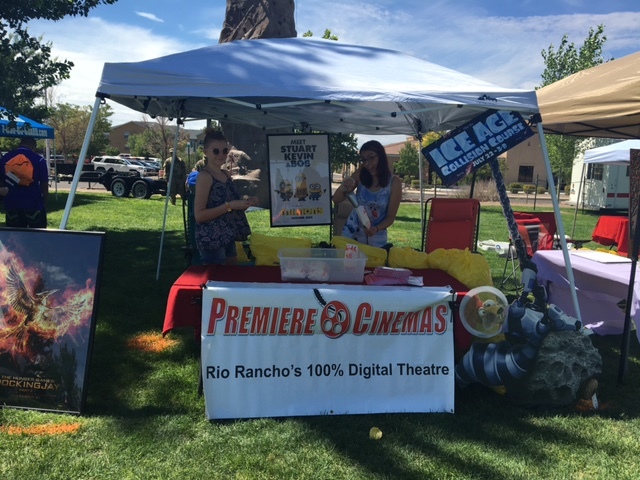 It was fun and games at Rio Rancho's 11th annual Mayor's Fun Day Sunday, and Premiere Cinemas made a big splash as event sponsor. The event happens each year at Haynes Park, and includes swimming, bouncy houses, kids' games, music, scavenger hunts and tons of other free fun stuff. The Mayor refers to it as a HUGE community picnic with good family, food and friends. Premiere set up a booth decorated with framed movie posters, and handed out tons of Premiere paraphernalia and provided free popcorn to the event. "We gave out over 800 bags of popcorn in all!" exclaimed Sandy Dodson, local Premiere Director. "Our committment to community involvement comes from the heart, our goals are to support and enrich the quality of life in our markets in every way possible, "addded Premiere's owner Gary Moore. "Sandy and her staff take this to a whole new level, they're local, and they truly love Rio Rancho, and try to be a part of everything worthwhile that defines this city." Sandy's famous involvement in the community has certainly not gone unnoticed. "Business owners, parents and guests are all the time stopping me to give me a hug and thank us for all we do in the community, it's amazing. I feel like a celebrity because they always want to talk about movies and their experience at Premiere, and they think of me as their local source of knowledge on all things movie-related. I'm loving it!" Sandy is also active in the Chamber of Commerce, and encourages her staff to get personally involved in giving back to the community. "We host many local and surround schools for early morning movies, theatre tours, do Q&A for kids and special needs groups, and classes educting them on job openings and performance. Premiere Associate Sarah Graves-Brown and Kaylee Dodson helped man the booth this year. The event is coordinated by Rio Rancho Kiwanis Club, The CIty's Parks and Recreation and community Services department, the Rio Rancho's Boys & Girls Club, and the City of Vision Civitans. Money raised goes to fund scholarships, Boy Scouts and other local civic causes.